This past Monday was a big day. I had been invited to attend the Get Motivated Seminar in Atlanta. Many were going to be there and the speaker list included Colin Powell, Lou Holtz, Steve Forbes, Bill Cosby and Rudy Guilliani. 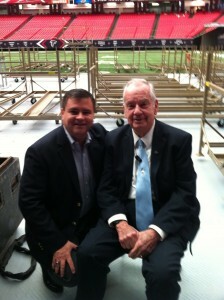 My big excitement was that I was going to have the opportunity to meet Zig Ziglar. For years Zig has been motivating people around the world. As it turns out, I was fortunate to meet not only Zig but his daughter Julie and the Red Head. Due to an accident a couple of years ago, Zig is not the same person he once was. However, he still has it. I think I could have talked to him for hours. It was interesting that while we had never met that I was treated just like someone he had known all his life – not only by Zig, but with his wife and Julie. What a great family. As I came around the corner at what appeared to be the 50-yard line of the Georgia Dome, Zig extended his hand and I introduced myself. The next words out of his mouth were, “you need to write a book.”. It was like he had been waiting on me just to tell me that. Did he really know what I had in my pocket? I explained to him that the book was in progress and I had a copy to give him. When I said that he asked me, “does is encourage people and do you use the word encourage?”. Frankly, I wanted to say yes, but could not as I wanted to make sure first. His words of encouragement to me were that people today and everyday are looking for someone who will encourage them. People want encouragement. After some time together, we parted as he was coming on stage. As he spoke, I looked around to the 10,000 plus people in attendance and it dawned on me – we are all here looking for encouragement. The encouragement we were looking for was to come from the leaders speaking that day. I am not sure who left encouraged, but this ol’ boy did. How about you. Do you need encouragement? Are you encouraging those you are around? Zig truly encouraged me to keep helping people with their finances, their careers, and with their life goals. Congrats for you. Good luck with the book. Hello son. Your mother did not know you were writing a book. Just wanted you to know we are so proud of you and your encouragement to others. We are continuing to lift you up in prayer. I would also like to buy your book when it is finished. Love mom. Hi Parkey – that was a great story. I was envious that I was not at that conference when I heard about it on the news. Somehow I missed hearing that it was coming up. That is great that you got to meet someone you admired. I miss working with you, heck I miss working! You were always one of those people that were always so positive and could make me feel better just by chatting, even if you were asking me for a favor. I agree with Laura, I would love to buy any book that you have written because you are great at encouraging and you don’t have to use the word encouragement to do it! What a great experience! Encouragement is SO important! I think of the role of Barnabas in the life of the Apostle Paul. Shortly after his conversion, Christians were having a hard time believing that Paul really was a follower of Christ. Barnabas bridged that gap, reaching out to Paul and reassuring the others. What an encouragement that must have been to Paul! Neat to hear that Mr. Zigler was able to encourage you, to continue encouraging others! God bless!